I think the title has revealed it all .. It’s somewhat Autumn-ish kinda salad but oh well, we don’t really need a season to eat a particular thing when pumpkins, sweet potato and beetroot are found all year round here in Malaysia. As easy as that!! Even easier without a recipe, but I’ll just give a rough estimation..
1. Wash, peel and remove seeds from pumpkin. Cut into 1″ pieces. 2. 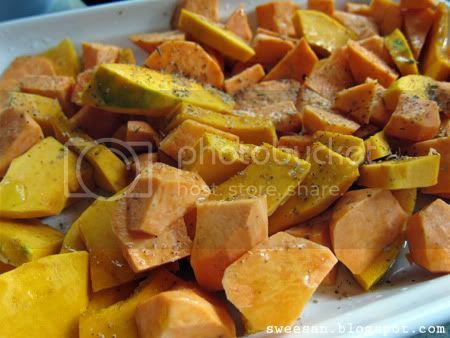 Wash, peel and cut sweet potato into 1″ pieces. 3. Place pumpkin and sweet potato in the pan, drizzle with some olive oil, add in the herbs, salt and pepper and toss everything together. Bake at 150 C for 15 minutes. The time really depends on how big the veges are and how soft you want the veges to be. 4. To make croutons, dice bread into small cubes, drizzle with some oil and herbs. Bake in a separate pan for about 15 mins. 5. Wash, peel and slice the beetroot into very thin slices. Add in the pumpkin and sweet potato tray and bake for another 10 minutes or so..
6. Chop some romaine lettuce or any preferred leaves. I like to use fresh spinach leaves (not the chinese spinach ya). Toss in, add in more olive oil if you want to. 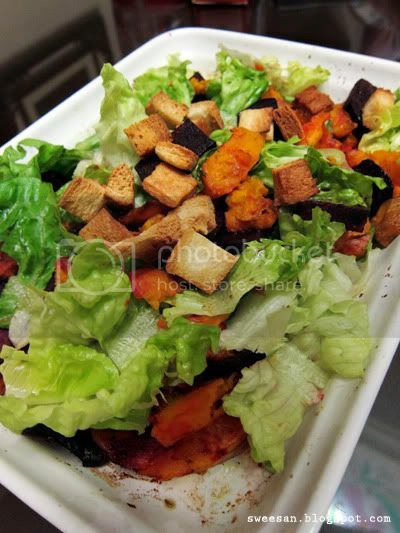 Add croutons on top.. This sound healthy ! Have a great weekend. A beautiful salad. You have my favourite there….sweet potato! Indeed yummy… all those baked roots sure taste fabulous! Is this what I call healthy eating? Beetroots….I never eat them when I was in Malaysia, I don't know why!